For kids with diabetes, taking care of teeth and gums is an important part of managing the disease. People with diabetes in general have a higher prevalence of gum disease. That’s because high levels of sugar in saliva cause bacteria to grow, which increases plaque buildup. Plaque that isn’t removed from teeth can lead to tooth decay, infection and other problems. Newer research also shows that gum disease may also elevate blood sugar, according to the American Diabetes Association. “Like all infections, serious gum disease may be a factor in causing blood sugar to rise and may make diabetes harder to control,” the diabetes association said. All the more reason to make sure your kids see a dentist regularly. Good eating habits also promote healthy teeth. Calcium and vitamin D help build strong teeth and bones. Begin regular 6-month cleanings at age 2, or when your child’s teeth start to come in. Talk with your dentist to schedule a meeting before your child’s first dental exam. Preparing questions before the visit will help you have a more meaningful discussion with the dentist about your child’s dental health. This can help make your child’s experience a positive one. Ask your nurse or doctor if you have concerns about your child’s first dental visit or about a dentist who specializes in treating children. Talk with your dentist about fluoride for bone support and strong tooth enamel. Sources of fluoride include drinking water, toothpaste, mouthwash, fluoride tablets and treatments done by your dentist. Well water does not contain fluoride. Only bottled water marked with fluoride on the label contains fluoride. Talk to your dentist about sealants on permanent teeth. 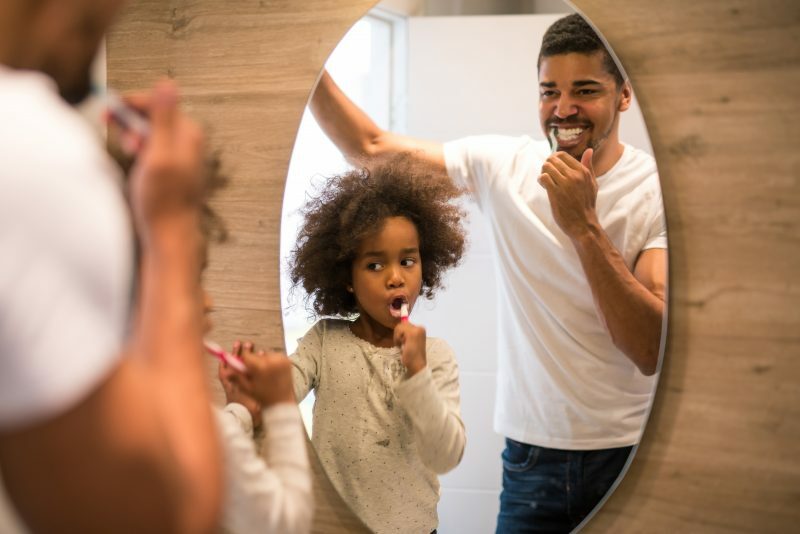 Teach your children how to brush their teeth as part of a morning and bedtime routine. Brush 2 times a day with a soft- to medium-bristle toothbrush sized for their age. Replace toothbrushes every 3 months. Floss every day to remove plaque and food between teeth that the toothbrush cannot reach. Start with the teeth at the back of the mouth and move to the front from top to bottom. Call your dentist if your child has a toothache or red, swollen, tender or bleeding gums.